Do you have photos, historical accounts or other items pertaining to the Keewatin area? Would you like to share this historical information with the world? LakesnWoods.com would like to publish your Keewatin photos (current or historical) or historical accounts on this website. Original materials can be returned and your privacy will be respected. "TELL ME THE TALES THAT WERE SO DEAR LONG, LONG AGO"
THIS is the story of Keewatin and its Pioneers, the men and women who built their homes and their town in spite of difficulties, privation, and hardships. They have watched Keewatin grow from a few log shacks in the midst of a cedar swamp to an up-to-date and modern town. They have watched the growth of good roads, of modern communication, and conveniences, and of excellent schools and churches. They have seen the change from the pick and shovel days to the highly mechanized life of today. They have progressed from a town of shacks with a potato patch in each front yard, to a town of comfortable, modern homes with beautiful yards and tree-lined streets. This story can in no way be considered an authentic history of Keewatin. There are no printed records of early life here. It has been gathered, bit by bit, from the stories of the few pioneers who are still with us. It is their sincere wish that they may share with you their memories of Keewatin in the "Good Old Days". In the very beginning, it was the timber that brought the first settlers to this community. The surrounding country was covered with a heavy growth of White and Norway pine with some cedar in the many swamps. The large logging companies began their operations before 1900, and by 1910 most of the big timber had been removed. Several companies logged near here, but the Swan River Logging Co. was most active and had camps close to the present town site. John Bush ran a camp where the Mesabi Chief pit is now located. There was a camp near the Bennett Mine, and one at Welcome Lake near the Bennett No. 2 shaft. Other camps were on the present school site and at Moore's Siding on the Great Northern tracks about a mile west of town. Mr. Charles Latvala of Nashwauk was one of the operators of this camp. Mrs. Manu Jarvi was employed there as a cook, and Mr. Matt Kyjander also worked there. The logs were sometimes loaded on cars to be shipped on the railway or hauled by team to Big O'Brian Lake. From there they were floated down O'Brian Creek to Swan Lake then down the Swan River to the Mississippi. Logging Camp at Moore's Siding in early 1906, Latvala, Rantala and Erickson, co-owners of camp. Esther; All the youngsters are children of the Leander Ahos. Life in the lumber camps was rugged. The men worked from dawn to dark and were paid about $18 per month plus their board. Food was plentiful but coarse, and water usually had to be hauled in barrels. About 250 men were employed here in the camps with more than half of them being Finnish. After the big timber had been removed, the smaller growth trees were cut for posts, mining timber, and pulpwood. Shacks on Second Street north of John Hren residence. Left to right: John Heino, unknown, Koivunen Tahtinen, Mr. and Mrs. Urho Honkanen, Olivi and Erick. Because the additional activities in the mines brought more people, the owners of land decided to start a new town. This they proceeded to do, and almost over night, there was a town named Keewatin right in the middle of a Cedar swamp. The first place of business was a tent on the corner of the present Michelich Hotel. Here Mr. H. Logan sold bottled whiskey until he could erect a building for his saloon. The first store building was built by Mr. Max Shuirman, who was soon joined by his brother, Mr. Harry Shuirman. The Shuirman store is still doing business in the same location. Other early business men were Jake Jaffe, I. Karon, Michelich Bros., Jacob Kuru, and George Matakovich. Tony Chopp started the first grocery store, and Joe Chastan and August Anselmo started the first bakery. P. J. McGuire opened the "Pine Tree Saloon" in what is now the Budreau home. All Paddy had to start in business with was a barrel of whiskey and some glasses. By 1903 there were eight saloons, the town was really growing and business was booming. first house on Second Avenue now occupied by John Mainerich. Frank Kerback was one of the crew who cleared the stumps and rocks from Main Street, while Noah Tanguay of Hibbing did the grading and graveling. There were no sidewalks until 1907 when wooden walks were built in town and later extended to the St. Paul and Mississippi. The old road to the St. Paul went past the school and out where the pit was made. The mud on the main street is still a vivid memory to the early residents. One woman recalls losing a shoe near Shuirman's store. It was never found. There were several wells where the people could get their drinking water, but water for washing had to be carried from Wellcome Creek. After the St. Paul mine started, all the wells were dry except one near Wellcome Lake. In 1908, the village hired Fred Vadnais to haul water for the St. Paul and town until the water works system could be completed. scattered on the ground. The stage also carried passengers, but the roads were so terrible that a trip to Hibbing was quite an ordeal. The first post office was established in 1907 in Shuirman's store with Max Shuirman as the first postmaster. Shuirman's Store. The central door was first the entrance the bank; later it was the entrance to the post office. Most of the supplies came by way of the Great Northern which at first made only three trips a week. As there was no depot, freight was dumped along the track to be claimed by the store keepers. A box car was finally brought in to serve as a depot, and Mr. Nickerson was the first agent. A real depot was completed in 1911. Keewatin has had three newspapers and a job printing shop, but none of them was permanent. The first paper was the "Keewatin Plain talk" edited by M. P. Phillips which lasted from 1913 to 1917. Then H. D. Horton took over and published the "Keewatin Chronicle" until 1927. In 1939 the "Keewatin Bugler" edited by Bob Haugen and Peter Filippi expired after about six months. News of Keewatin can be found in the Nashwauk papers as early as 1910 and the present Eastern Itascan has a Keewatin page. Life in the early days was decidedly primitive according to our present day ideas. Many were the fights and many were the times that guns and knives were used. Murder was not uncommon. The old timers recall that their good times usually were their get-togethers in the homes of friends where they talked about the old country and sang or listened to accordion music. The early dances were held in the "Wooden School", in the Finn Hall and in the Village Hall. After 1914, many dances were held in the Grade School Auditorium which boasted the best floor for dancing on the range. Every evening during nice weather, many of the villagers would gather at the depot to wait for the "Merry Widow", the nickname for the daily Great Northern train. The mail came on the train and was hauled to the Post Office on a cart and then distributed. Waiting for your mail was part of your daily schedule. The Post Office was such a good place to visit with your friends and meet your dates. Because of modern transportation, mining locations are no longer needed so the people have moved to town bringing their houses with them. Keewatin has houses from all the nearby mines and has grown a great deal in size if not in population. In the early days, as many as twenty different languages were spoken here. The years have changed this and now we have no "Little Italy" or "Little Austria", just one nationality, American. LIVE AND LOVE IN MY HOME TOWN"
MAX SHUIRMAN was the first of v 1 the Shuirman brothers to arrive in Keewatin in 1903, but he was followed shortly afterwards by his brother Harry and his family. The two brothers formed what was known as the Shuirman Brothers' Store. Max was also postmaster at the first post office, which was simply a section of Shuirman's store. In 1910, Max left town, but among the early annals are recorded his efforts to get the village incorporated. Harry's eldest son, Joe, then went into business with him, and it became known as Shuirman and Son—a name that existed until a few years ago when the store became just Shuirmans. The business has expanded and been changed many times. In 1955, the clothing end of the business was discontinued, and the furniture and hardware sections have been enlarged. Since 1918, when he married Alice Shuirman, Louis Ginsberg has been one of the partners in the store. The other Shuirman children besides Alice are Joe, Bessie, Gabriel, Theodore, Abraham, and Neil. Among the prominent citizens who have lived here a long time, are Mr.and Mrs. F. V. Wakkinen. Mr. Wakkinen was the cashier of the First State Bank when it was opened in the Shuirman building in 1910. On January 15, 1911, the bank was moved to its present location and in 1906 became the First National Bank. Mr. Wakkinen served as a member of the School Board, and both Mr. and Mrs. Wakkinen have been active in the growth of Keewatin.They had two children, Alice and Verna. Pearl (Mrs. J. D. Geving) here in Keewatin. Among Mrs. Geving's reminiscences is that the pupils from the St. Paul Location were taken to school in town in 1906 in a bus drawn by horses from Mike Michelich's Livery Stable. Also, that her aunt and uncle, Mr. and Mrs. Luke Osborn, were among the early pioneers. Pearl Murphy and Mildred Bell were the first two people to graduate from the 8th grade here in Keewatin. Hjalmer Saari came to Keewatin in 1911. His wife didn't arrive until 1917, however. Besides working in the mines, Mr. Saari operated the old Finnish Boarding House on 4th Avenue. He recalls that men paid $3.00 a month for a room and $18.00 a month for board. At the present time, the Saaris live at Little McCarthy Lake. Their son Martin is in Minneapolis. Mr. Jacob Wakkinen, a brother of Victor Wakkinen, worked here in the early days as a carpenter. Mr. and Mrs. Wakkinen had three children, Rudolph, Lydia, and John. Mr. and Mrs. P. A. McEachin were among the very first arrivals here. They lived at the John Bush lumber camp several years before Keewatin was plated. Moving to town they bought the Bolton Lumber Co.'s building for their first home. This was later the kitchen of George Williams' restaurant and was used by the lumber company during the construction of the first school. The McEachins built their own store building on Third Avenue. Mr. McEachin was very active in village politics. He was Postmaster, one of the first Justices of the Peace, a member of the Council, Village Clerk, member of the Water and Light Board and was a member of the School Board from 1915 until his death. The McEachins had five children: John, Lawrence, Neil, Richard and Dorothy. Mr. and Mrs. Nystrom came to the St. Paul Mine probably as soon as it was opened and ran the boarding house there. Mrs. Nystrom was a sister to Mr. Frank Dellwo. Mr. Axel Nelson came to Keewatin from Eveleth about 1913. He worked at the mines; was on the police force a while; and worked as janitor at the school. He was married to Mrs. Johnson who had three children; Charles who still lives in Keewatin; Elsie and Albert. Joe Chastan arrived here in 1905 before the town was even incorporated. The year after his arrival, Gust Anselmo and he built and opened the first bakery in the present Starcevich building. Mrs. Chastan came over from Hibbing to work in the bakery. and in 1907, Mr. Chastan and she were married. In the fire of 1908, when all the families in the village were evacuated by train, Mr. and Mrs. Chastan and Mrs. Bertogliot were the only ones who remained behind with ready horses. Mrs. Chastan remembers that she frequently picked blueberries in the forest where the D'Andrea building now stands. The Chastan family includes Henry, Joe, Jean, Adelaide, and Marie. Frank Stobinski came to the United States from Poland in 1907. The same year he came to the iron range working in Virginia, Mt. Iron, and at Stevenson. But because of the scarcity of employment, he went to Duluth. There he married Sylvia Pelz, and they came back to Keewatin in 1912. They began farming and sheep raising, the occupation in which they are still engaged. Their seven children are Frances, Mrs. Matt Lott, Sr., Marylu, Mrs. Henry Wessel; Sue, Mrs. Ralph Yepp; Elizabeth, Mrs. Glen Newman; Marcia, Mrs. Peter Lubovich; John, and Frank. Matt Stockovich was born in 1882 in Yugoslavia. When he first arrived in America he settled for a time in Pittsburgh, but he came to this community in 1906. His first job here was to work for a contractor at the St. Paul Mine making a grade for railroad tracks in 1907. He worked at various places among them the Forest Pit, Alexander Mine, Mississippi, Bray and Stevenson, and Bennett mines. He worked at the latter mine for 34 years until his retirement in 1948. Of his 5 children Clementine, John, Matt, and Tony are in California. Mrs. Rose Ruhanen resides here. Mr. and Mrs. Jacob Kuru were here very early. Mr. Kuru built one of the first business buildings which is now occupied by Joe Grcar. The Kurus had two children; Russell who lives in Seattle, and Florence of Duluth. Although not among the earliest arrivals, Mr. and Mrs. J. C. Hoskinson played a part in the development of Keewatin. Mr. Hoskinson came in 1915 to be principal of the schools. He served also on the Village Council and was active in all community affairs. The Hoskinsons had three children: Phyllis, William and John. Mr. and Mrs. Frank Dellwo came to the St. Paul probably in 1906. Mr. Dellwo worked awhile at the mine, and then moved to town where he served as street commissioner for many years. The Dellwos had three children: Paul, Marie and Ann. Fred Culver, an early citizen, was given the contract to build some of the first wooden sidewalks in the town. In 1903, he was "fire fighting foreman" at $2.50 per day when working and also served as street commissioner. Mr. and Mrs. John Bell came first to the St. Paul in 1907 and then into town. Mr. Bell worked first for the Swan River Logging Co. and later was Chief of Police. They had four children: Floyd, Mrs. A. L. Harwood, Mrs. S. Pavalak, and Mrs. H. W. Stish. James Theodore, always called "Big Jim", also came by way of Stevenson in 1906. He left for a while but returned in 1910 and lived at the St. Paul. He soon moved his family to town and lived upstairs in the Gontero building where he conducted a saloon. In 1914, he built the Theodore Hotel and in 1915, opened a soft drink parlor and restaurant. The Theodores had five children: Joe, Sam, Jennie, Amelia and Annie. "Big Jim" still lives on a farm south of town. Another name which appears in Keewatin records was Jack Bush. He came early and had a lumber camp located where the Mesabi Chief pit is today. Mr. Bush was also a member of the first Village Council. Mr. and Mrs. Charles Savoy who first resided in Browerville came to Stevenson and then to Keewatin in 1911. They operated the first boarding house at the Bennett and were one of the first families at that location. Mr. Savoy had been a cook many years and his family had many interesting adventures in the old lumber camps. The Savoys built their home in Keewatin about 1918. They operated restaurants in Nashwauk, Brookston and in Keewatin. In 1925, Mr. Savoy retired from the restaurant business and was employed as night watchman at the Schools until his death. His daughter, Dorothy, is at present living in Hawaii. Mr. and Mrs. Joe Mayerle and wedding attendants Another early log cabin home which was first built here was owned by the Joe Mayerles. The Mayerles came to Keewatin in 1905, a year before the village was incorporated. Besides being a miner for many years, Mr. Mayerle held various village jobs being a constable at one time. The Mayerles had a large family of ten children most of them still living here. They are Joe, Frank, Ludwig, Ann, Rose, Mary, Tony, John, Josephine and Julia. The first superintendent of the St. Paul mine was the popular E. F. Remer. He was very much liked by his men. He became Keewatin's first mayor. Mr. Remer and his son, Charles, live in Hibbing now. Charles has the distinction of being one of the very first babies born in Keewatin. The year 1906 also saw the arrival of John Gontero, a bachelor. He worked for a short period at the St. Paul mine, but he decided to open a shoe repair shop. He operated the shop until his death in 1946. John added to the folklore of the village. with his many stories. He always was proud of his physical prowess and of his training in the Italian army. Mrs. Carl Walila, who worked at one of the first boarding houses, came to Keewatin in 1909, a year before her husband. Mr. Walila was a janitor at the grade school for a number of years. Of their five children one girl, Mrs. Frank Dickovich, still lives in Keewatin. The Walila's moved to a farm in 1925. Another early merchant who has played a prominent part in the founding of the town, is H. M. Markus. Coming from Duluth in 1910, he established a clothing store which he continued to operate until his death in 1951. Thereupon, his daughter, Sadie, took over the store until she was forced to retire in 1954. The other Markus children are: Ben, Elsie, Rita, Florence, and Lauretta. More than anything else, Mr. Markus will long be remembered for his humanitarian efforts. He had a sincere interest in his fellow man. This interest was so keen that after his death, his family planned to establish a memorial to his name through a scholarship to promote inter-faith understanding, which certainly was the life time work of this pioneer merchant. That Memorial Award is given each year to the high school senior, who through personal behavior and action, has symbolized good human relations. Mr. and Mrs. Ralph Blackburn were early arrivals coming here from Stevenson. Mr. Blackburn was the first clerk at the Bennett and remained in that capacity until 1926. Mrs. Blackburn was a former teacher in Nashwauk, arriving there to teach in 1906. She recalls many interesting events in both Nashwauk and Keewatin early history. Mr. Blackburn was a member of the School Board and also engaged in the logging business here. Mr. and Mrs. John Beecroft arrived from Aurora to live at the Bennett location in 1913. After some years at the Bennett, Mr. Beecroft became Mine Safety Inspector for the County and held that position until his retirement. The Beecrofts had two children, Robert and Kathleen. William Steenstrup opened a jewelry store in 1913 in the Bank building, and later moved to his own store, which is now Chappels. Mr. and Mrs. Steenstrup were always active in the affairs of the town. Bill served on the school board and on the village council. One daughter, Dorothy, lives in California. The first Finn bath was owned by Mr. and Mrs. Pete Hill. Moreover, they started a meat and milk business in 1913. They lived in the little house midway between the St. Paul location and town which has been occupied by the DeFonsos and the Minerichs. Mr. Hill passed away about 20 years ago. Carl Cusciotto, who is known as "Candy Carl" was born in Italy in 1384. He was married in 1908 and arrived in Keewatin from Bovey in 1912. Carl built his drugstore here in 1913 and remained in that business until it was destroyed by fire in 1953. Since then, he has been retired. Mr. Cusciotto took a very active cart in politics. He has been a member of the village council for one term, and he was a member of the school board for 15 years. While he was a school director, he served one term as the president of the Range School Board association. He also was instrumental in reorganizing the Keewatin Volunteer Fire Department and was fire chief of that organization for two years. The Cusciotto's two children; Loretta, (Mrs. Strande) lives in Hibbing and Paul operates a drugstore in Nashwauk. Nick Spadaccini, Sr	 Listed among the present day merchants is Nick Spadaccini, Sr., who dated his arrival back to 1913. Except for a brief career as an electrician at the Bennett Mine, Mr. Spadaccini has had an uninterrupted business life. His first place of business was the Rex Saloon. In 1918, his hotel was built. Later, when the country was dry, he had the first pool hall in the village. At the present time, he is the distributor for Philco products as well as for Fitger's beer. Mr. Spadaccini served as Fire Chief for a time in 1914. About this time, he joined the Gallina brothers' dance band. 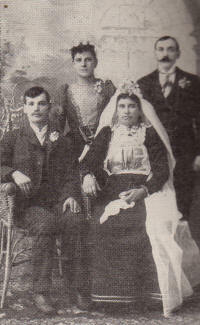 Mr. and Mrs. Spadaccini were married in 1915. Their three children are Victor, Rose, and Dolly. Joseph Vukmonich arrived in Keewatin on foot from Eveleth in 1907. His first home was in an abandoned lumber camp about two miles west of the village. In 1909, he went back to Europe for two years and then returned to Keewatin. In 1913, his wife and their three children, Mary, Frank, and John arrived, and they continued to live in the lumber camp until 1916 when they moved to the Mississippi and later to the St. Paul. Three more children, Katie, Lucy, and Rose, were born in Keewatin. Mr. and Mrs. E. B. Verity moved to the St. Paul location in 1909. Mr. Verity had been an expert timber cruiser in early years, but after the death of his wife, turned to contracting so he could be at home with his young children. He built one of the first houses on Second Avenue. Much of the construction of the sewer, and heat lines, the sidewalks and roads was done by Mr. Verity. He also was at one time a member of the police force and did some logging. There were four children, Harriet (Mrs. John Suzich), William, Laura and Hazel. O. J. Reppe's letter tells his story: "Am giving you my history as a Keewatin resident. I think it was 1913 I arrived in Keewatin. One good way to tell, I think it was the year after that, 1914, I was elected Justice of the Peace. I am still called judge by the people that see me in Miami. I started a tailor shop on Shuirman's lot next to his store. Then I moved to Matakovich's empty corner but it burned down. Then I moved to a 2 by 4 building opposite D'Andrea's. Next I bought a lot katicorner to D'Andrea's. Then I sold my place to a shoemaker, bought a car and a telescope to view the stellar orbs and arrived in Miami about 26 years ago. I am 84 years old, but I think I would have been dead long ago if I had stayed in the Keewatin winters. The offices I held in Keewatin were these: Mayor, Justice of the Peace, and Fire Chief. Was single all this time. On account of my age I can not promise to come. Hope your celebration will be good." Yours truly, Ole John Reppe. When Nels Lindahl, the carpenter, contracted to build the Steve Milani home in 1912, there were only two other homes in Spina Addition: Comparoni's and Burns'. During the houseraising, Mr. Milani had a huge platform put up to have a dance. That evening the whole town turned out for the merrymaking with the ever-popular Steve providing the dance music on his accordion. Mr. Milani and his accordion are definitely a part of the local folklore as he played for so many dances. James Bevacqua, Sr	 The Milani family consists of Mary, Rose, Steve Jr., John, and Albert, who is deceased. Mr. Milani was the school janitor from 1921 until his death. James Bevacqua, Sr., also known as James Beve, first came to Keewatin in 1906, but because of the shortage of living quarters moved to Stevenson. In 1907, he reported to work at the old Forest mine. During the slack period, he was a bartender at Stevenson. After his marriage in 1911, he returned to the Bray location and from there to the St. Paul location. At the present time, both Mr. and Mrs. Bevacqua and their three sons live in Keewatin. They have five daughters living elsewhere. Their children are James Jr., Joe, Louis, Camilla, Theresa, Christine, Mary, and Cecelia. Arriving here from Eveleth in 1907, Mr. and Mrs. George Matakovich opened a grocery and butcher shop in the old Christianson building. He continued in this business almost all of his life. Mr. Matakovich also played an active part in village politics, being village treasurer and mayor for several terms. Mrs. Matakovich makes her home with her daughter, Clementine Grcar, while her son, George, lives in California. Even though Tony Molea arrived in this country from Italy in 1899, he didn't make his way to Minnesota until 1904. In 1903, he came to the Bray location. Several years after his arrival, he married Antonia Bevacqua. They had six children, Frank, Jane, Carmella, Mary, Rose, and Tony. Tony was killed during the war and Frank died later. Mr. Molea was a long time employee of the Republic Steel Co., and later of the Pickands Mather Co. Mr. Molea lives in Keewatin with his daughter, Carmella. August Anselmo was a partner of Joe Chastan in the first bakery in town. After a few years, he sold out to Mr. Chastan and returned to Europe to be married. They came back to Keewatin and made their home. The Anselmos had five children, Peter, Enis, Evelyn, Isobel. Mr. and Mrs. Ernest Conte were also early settlers. Mr. Conte was the agent for a beer company and also had a livery stable. The Conte's built the house on First Avenue, which was bought by J. C. Hoskinson. They had two boys. Tony Lagar or "Chicago" as he is usually called came here in 1911. He was among the first boys to report to the Army in the First World War. After the war, he returned here and has been employed in various jobs. For the past few years he has been Street Commissioner. Mr. and Mrs. Logar had four children, Ann, Betty, Alvina, and Max. Mr. and Mrs. Oscar Skogland were among the earliest arrivals at the Bennett. Mr. Skogland was mining captain for many years. The Skogland's two children are Margaret and Jack. Since his retirement the Skoglands have been residing in Hastings. One of the new buildings on the main street erected since the 1953 fire is "General's Sundries" operated by Mr. and Mrs. Tony General. Tony is one of the early businessmen, having had a series of establishments in the village. In 1913, he had a pool hall in Mike Michelich's building. The next year he bought a Ford, which he used as a taxi. The fare to Hibbing was $5 a trip and $20 to Chisholm. Next was the livestock business and in 1939, he went into the grocery business. The General's daughter, Dorothy, is in Duluth and their son, Max, is with the army in Germany. Joseph Schutte came to Keewatin in 1906 from Eveleth where he had been working since 1901. Here, he met and married Katie Michelich, who was working for her brother, Mike. When the village power plant was put in, Mr. Schutte took charge of it until his death in 1913. The Schuttes had six sons, Ernest, John, Mike, Peter, William, and Joe. Mr. and Mrs. Joe Schutte, and six sons. Like so many of our other pioneers, the Tony Perrellas moved over to Keewatin from Stevenson in 1912. After a brief period as a miner at the Bray, Mr. Perrella became a fireman at the power plant. During the last years of his life, he served as a watchman at the school. Perrellas had eight children, Peter, Torn, Tony, Lillian, and Caroline live in Keewatin, Carmella is in Nashwauk, Sam in Hibbing, and Rose is in Escanaba, Michigan. Among the long time residents are Mr. and Mrs. Art Hall, who were married here in 1913. Their first abode was a tent out at the popular Wellcome Lake. Later, they built their home in Spina. Mr. Hall was always very active in village affairs, and he held several different offices. He was the Village Clerk for twelve years, school director for two terms, and Chief of Police for a period. One of his projects was to foster the Townsend Plan in Keewatin. Mr. Hall was an active musician having played the tuba in the City Band for 20 years. When he first came to Keewatin in 1909, Mr. Peter Nickovich worked at the Bennett Mine. After he was married in 1912, he moved to the St. Paul location. The Nickovichs have three children, Mildred, Mike and Peter. Mr. Nickovich is now retired. Oscar Waara was here earlier, but arrived to live here in 1912. He married Mrs. Waara in 1913. She had been working for several years at the Otney Boarding House on Fourth Avenue. Prior to his death, Mr. Waara was employed at the school for 8 years. Of their four children, Tony Rebrovich lives in Keewatin, Gertrude Kinzel in Hibbing, Reino in Minneapolis, and Paul in Buffalo, New York. In the early days, Sig Lindahl helped his father construct some of the early homes. Then for a time, he worked on the locomotives for the Butler Bros. until he became a deputy sheriff for a period. Finally in 1927, he became chief of police, a position he still holds. Mr. Lindahl's wife is the former Minnie Latvala, a resident of the community since 1906. At that time, Mrs. Lindahl lived with her sister, Mrs. John Maki. Mrs. Lindahl has many memories of the original pioneers and of the town. As far as the social life was concerned, Mrs. Lindahl recalls the popular dances which were held in the second story of the "wooden school". Mr. and Mrs. Kubieda and their children, Josephine and John, lived at the Forest mine in 1912. The village blacksmith was another old-timer named Joe Schweiger. In 1906, he made his home out of his own logs cleared from his land. That log home is still standing on Fourth Avenue. Mr. and Mrs. Schweiger and two of their children, Frank and William, are dead. The surviving children are Mary and Joseph. Mr. and Mrs. Nick Dickovich, who are considered two of the earliest pioneers, arrived on February 16, 1906. In his recollections, Mr. Dickovich says there were eight buildings that formed the town. Mr. Dickovich worked at the St. Paul mine and built his present home in 1910. The Dickovichs have seven children: John, Nick, Jr., Frank, George, and Anne in Keewatin; Peter in Eveleth and Margaret in Minneapolis. Mr. and Mrs. Einer Kettunen became residents of the community in 1913. They lived at the St. Paul for many years. Their two children are Elmer of Keewatin, and Elna of Florida. Mrs. Kettunen still resides here. Coming to the St. Paul location in 1912, Paul Vukodinovich alternated working in the mines and as a teamster in the logging camps. After the family moved downtown, he served as a patrolman until his death in 1946. Mrs. Vukodinovich lives in town with her son, Mike. The other children are James, Eli, Julia, Katy, Amelia, and Sophie. Another old timer was Victor Makinen who lived next to the Finn Hall. There were six children, one of whom is Mrs. Marvin Mitchell, the wife of the Sheriff of Itasca County. One of the first carpenters to arrive was Nels Lindahl, father of Sig Lindahl. Besides building a large number of the early houses, he constructed the Gontero building in 1911 for the Hamms Brewing Co., and the first Catholic church. Nels was also active in the logging business with another old timer, Ed Verity. Mr. and Mrs. Nels Lindahl and son, Sig. The house is now the Matosich residence. Coming from Stevenson in 1913, Mr. Generoso Conte constructed his first store "The Independent Market" with C. H. Donough as the manager. This store was situated in what was later known as Conte's warehouse. In 1915, Conte built the present "Conte Building" on the corner of Main and Second Avenue with his living quarters in a home behind the store. He had a very flourishing business until his retirement. The Conte's three daughers are Lucy, Olga, and Charlotte. Mr. Conte passed away in 1951. When Mr. and Mrs. Frank Grivest came in 1911, he went into partnership with Tony Schweiger at a logging camp. Later he decided to go into the bakery business. However, just before his death a few years ago, Mr. Grivest was employed as a janitor at the school. Their three daughters are Agnes Adams of Keewatin, Mary in Illinois, and Rosalie in Michigan. Dominic Emanuel, Sr., arrived in this community from Hibbing in 1913. He began working at the Bennett mine and continued there until he retired. Mr. Emanuel passed away in 1939, but Mrs. Emanuel is living with her son, John. The Emanuels have one daughter, Mrs. Dominic Moudent, and seven sons, Dominic Jr., Victor, Paul, Patsy, Tony, Joe, and John. Charles Adams was the first Treasurer of the Village. He served also as the Superintendent of the Water & Light Plant. There were two children: Jane and Charles. "Andy" Olson came to Keewatin from Superior in 1907. The town was still a dense swamp so Andy assisted in clearing the townsite. Mrs. Denning was living here already. Andy married one of her daughters, and they had four children: Amos, Gladys, Mae, and Dorothy. The Olsons lived in one of the early homes here on Second Avenue. Andrew Olson passed away this year. Joe Bardine came to the St. Paul in 1903, and moved to the Bray in 1911 where they lived quite a while. They had a family of eleven children with Sebastian being the only one to remain in Keewatin. Mr. and Mrs. Bardine and the rest of the family have been in California for many years. The Bardines had a small mule which they claimed traveled at the rate of 6 miles in 7 days. When Woodrow Wilson was campaigning for the presidency of the United States, the Bardine mule was hired for two weeks by the Democrats to carry around pictures of Wilson. Charles O. Nordstrom worked for the Longyear Drilling Co. when he first came and later at the Bray and the St. Paul. He was married in 1911, and then lived at the St. Paul. There were three children; Clarence who resides in Keewatin, Leonard of St. Louis, Mo., and Hazel of Miami, Oklahoma. The Nordstroms moved to a farm north of the town in 1935 where they still reside. Jack DeFonso came to America in 1903 going at first to the Stevenson. However, in 1908, he was transferred to the St. Paul as a pit boss, and he remained here until his death in 1943. Mrs. DeFonso and part of the family joined him here in 1910. The family consists of Louis; Rose, Mrs. Mike Cappelletti; Chiarine, Mrs. Joe Perry; Victor all of Keewatin, and Mrs. Isobell Vendetti of California and Mrs. Geneva Matosich of Cleveland. Arriving in a logging sleigh in 1906, Mr. and Mrs. Martin Verrant lived in a building owned by Mike Michelich. Later they moved to the St. Paul where Mr. Verrant was employed. The Verrants had eight children: Martin, Jr., Joe, John, Louis, and Charles all living in Keewatin. Mary and Frances are in Hibbing and Jennie in Buhl. A. E. W. Burns came from the Stevenson to work in Conte's new grocery store. Burns was an employee of the Sargent for 22 years, retiring in 1947. Their children are Percy, Robert, Rupert, Kenneth, Margaret, William, Genevieve, and Bernard. Alfred has passed away. Joe Cappelletti has lived in this community since 1911. He was married in 1913 and had three sons, John, Carl, and Robert in California, and Mary Louise in Eveleth. Before he retired from the St. Paul mine. Joe worked at the Mississippi, and had a garage business for a period. Mr. and Mrs. John Bren, who celebrated their golden wedding anniversary in June 1949, were married in Chisholm. They arrived in Keewatin during the winter in 1911. Mr. Bren also worked at various mines such as the Mississippi, Bray, and Bennett. For a time, he was employed by Mike Mihelich's Livery which was a transportation, hauling and taxi service. During the winters, he spent his time logging. Of their family two daughters are a part of this community: Catharine, Mrs. Ed Novack; and Anne, Mrs. George Juhlin. Mr. and Mrs. George Williams lived first in the Mississippi, where they had a boarding house. They soon moved to town and began their restaurant in the building next to the Catholic church. The Williams' enlarged the place and for many years ran a first class eating establishment. Mr. Williams also had a garage in the present Makinen's Super Market. Mr. and Mrs. Frank Rizzio were 1911 arrivals. He, too, worked at the various mines in the locality. Their children are Frank, Rose, Antoinette, Carmella, and Jennie. Gabriel Pauhu arrived in 1910 to work at the St. Paul mine. He is the only surviving member of the first Finnish Society which built the Finn Hall. John Maki was the janitor of Keewatin's first school which was popularly known as the "Wooden School". He continued to be the school janitor all of his life even at the new school. Mr. and Mrs. John Maki lived in the basement of that first school and boarded the teachers who took over the second floor. Mr. and Mrs. Maki had five children George, Norman, Earl, Doris, and Pearl. Romeo Tiberio came from Portland, Maine in 1908 where he had settled since his arrival from Italy in 1905. He worked at the St. Paul mine, but made a trip back to Italy to be married. However, Mrs. Tiberio didn't join him at the St. Paul location until 1914. In 1919, the family moved to Keewatin proper to their family home on Fourth Avenue. Mr. Tiberio retired in 1948 from the Bennett mine. There are three children in the family, Lawrence, Helen, and Marie who is Mrs. Tom Commerford. Alex LeVaque was one of the earliest pioneers who came to run a boarding house at the Forest mine. He also worked at the Bray and was the janitor at the Village Hall for several years. puddles in the woods. For many years, the Jarvis have lived on a farm south of town with their three children, Aili, Bruno, and Ero. Another pioneer who arrived fifty years ago is Angelo Gontero. However, it wasn't until 1912 that he married and built the family home on Fourth Avenue. An item of note is that at that time the Gontero home was situated at the back part of the lot to make room for a small candy store in the front operated by a lady simply remembered as "Rosie". Besides working at the mines, Mr. Gontero at one time owned a shoemaker shop. The Gontero children are Katharine, Orlanda, Adolph, Josephine, Victor, and Liberato. Mrs. Minnie Manson has lived in the community almost from its origin. Both her daughter, Senya, and she have been very ambitious and self-sustaining. Mrs. Manson states that Mrs. Jarvi and she often used to walk to Nashwauk to shop and that yard goods was only 3 cents. Also, that because of the scarcity of water, she used to set out pails and buckets to gather up all the rain water she could. In 1909, W. J. Mitchell arrived in Keewatin to be mine clerk and served ice boss at the newly opened Missisippi mine. Later, he transferred to the Bennett and worked for the Pickands Mather & Co. until he retired. In the early days, Bill was Justice of Peace of the village, and he was also the treasurer of the fire department He is now retired and living in Hibbing. In 1911, when Alex Hultti first saw Keewatin, he observed that the town was "full of bachelors and that there were only a few girls". As Mr. Hultti's wife didn't arrive until 1913, he roomed and boarded with his sister, Mrs. Manu Jarvi. Coming to the old Bray mine from Stevenson in 1909 was the Anthony Petrelli family. Mr. Petrelli was a track foreman at the Bray and also had a similar position at the Bennett. In 1927, the Petrelli family left Keewatin to settle in Rome, New York. The couple had 13 children with ten of them still living. They are Mary Buffetta of Palistine, Texas, Rose Mariella of Mt. Iron, Louise Cortese of Keewatin; and Nellie, Joseph, Jane, Anthony, Elizabeth, Rachel, and Katherine of Rome, New York. moved to Stevenson and worked there until work was started on the St. Paul mine. There were no houses at the mine so the men lived at Stevenson and traveled back and forth by team. As soon as the houses were built, they moved to the location. The married couples took in the single men as boarders until the boarding house was completed. When Keewatin was started, Mr. Webb moved to town and took an active part in its growth and development. For many years, he was Chief of Police and served several terms as President of the Village Council. He also served one term on the School Board. He was married to Miss Daisy Mitchell, a teacher in the local schools. In 1918, he bought the Dray and Ice business from Oscar Johnson and started his own "Webb Ice and Fuel Business", which is still being conducted by his son John M. Webb. Mr. Webb died in 1935 at the age of 63. Mike Michelich spent his first few years in this country at Chisholm where he met and married Katie Barich in 1902. After her death, he attended business school in Minneapolis and came here in 1905. Mike is a longtime businessman in the community having devoted his entire life here to various businesses. He has been identified with a saloon and restaurant business and a livery stable. For a long period before his retirement, he operated a grocery store. Mike has always been keenly interested in community affairs and served as village mayor in 1928 as well as on the Water and Light Commission. He was a director of the old First State Bank and is at present a director of the First National Bank. In 1935, Mike married Mary Gumbus who died in 1946. They were the parents of a son, Michael, Jr.
Frank Kerback, probably one of the first to reach Keewatin, lived in a log shack back of the Post Office. He later built the house on Second Avenue now occupied by John Mainerich. He worked with the timber cruisers and helped to dig stumps and lay out the streets when Keewatin was platted. Mr. and Mrs. Kerback had three children: Pearl, Hazel, and Valle. Mrs. Clyde Chappel is a niece of Mrs. Kerback. Peter Michelich came to Keewatin from Chisholm in 1905. He later married Mary Stayduhar who had arrived in this community in 1910. They are the parents of five children; Peter, who operates the present Michelich Food Market; Anne, Mary, Sophie, and Veronica. Among the business ventures that Peter embarked on in partnership with Mike Michelich, were a saloon and restaurant business, a beer agency which extended to Bovey, and a livery stable. As early as 1912, they hauled children to school from the Bray and St. Paul locations. Later, Peter began working at the mines. He interrupted his mining career in the 1920's to serve on the local police force, but he returned to the Bennett Mine until the time of his retirement. Mr. and Mrs. John Newman and son; Swan Korpela, others unknown. House now is Martin Verrant's residence. In 1909, when Mr. and Mrs. John Newman tried to erect their home on Second Avenue, they were confronted with many problems because of the swamp in the area. As it was impossible to drive a load of lumber right up to the site, the load was brought in bit by bit from Savoy's corner. That home is the present residence of Mr. and Mrs. Martin Verrant. Mrs. Newman is now living on a farm in Cloverdale. Mr. and Mrs. Frank Vessell arrived in town in a horse and buggy with their cow attached to the back of the buggy. In 1911, they lived on a piece of land that was between the Mississippi location and the Bennett. They had to carry their water for a mile or more from the Mississippi mine. Mrs. Vessell recalls that at one time or another quite a few of the "old timers" were their boarders. Mr. and Mrs. Vessell have been living in town for a number of years now. Mr. Vessell is a janitor at the school. The Vessells had a family of ten all of whom are living except Laddie. The others are Frances, Clementine, Frank, Charles, Henry, Julia, Rose, Harriet, and Josephine. After raising their ten hildren, they adopted a daughter, Alice, who is at home with them and is employed at the Hibbing General Hospital as an X-Ray technician. Mr. and Mrs. John Milan were early residents at St. Paul where Mr. Milan was superintendent of the mine for several years. Mr. Milan was also active in politics and served on the school board two terms. Charles Raniele came from Boston in 1909 where he had lived for four years. His first mine job here was at the Mississippi, but in 1913 he transferred to the Bennett. In 1917, he left the mines to work at the boiler house. The Ranieles bought the theatre from the D'Andreas in 1928, but didn't operate it themselves until 1933. In that year, they opened the Itasca Theatre, and have operated it ever since. When the W.P.A. changed all present sewer and heat lines, Mr. Raniele was the foreman in charge of the project. At the present, Mr. Raniele is still active having charge of the Itasca Sweet Bar. His children are Fred, Dominic, and Mary Louise of Keewatin, and Rose who is deceased. John Marold worked at the Mississippi mine when he arrived here in 1911. In 1916, he married Mary Setina. Of their five children, Mary and Jennie are deceased and Joe, John, and Frank live in Keewatin. Mrs. Marold still resides here. Mr. and Mrs. Marco Rebrovich came in 1910 and lived at the St. Paul location. Besides the St. Paul, Mr. Rebrovich worked at different times for the Bray and Mississippi. The Rebrovichs had six children, Tom, Tony, Steve, and Mary Grahek. Mr. and Mrs. Rebrovich and their sons, John and Nick are deceased. Carl Jeanette, one of our active elders, lived at the Stevenson location before he came here. He built his first home next to the first Catholic church. Both buildings were destroyed by fire in 1924, so Carl rebuilt his home at the same place. Carl worked as a teamster as well as for the Bennett mine. For a number of years, he worked for the Water and Light Department. Carl is proud of the fact that his daughter, Mrs. Mike Leone, was one of the first persons to graduate from the Keewatin High School in 1919. Mr. Jeanette is now 81 years of age. Tony Chopp, one of the original pioneers, dates his arrival back to 1905. He was first employed at the St. Paul and for the Swan River Logging Co. Tony was quite a teamster in early days with his mule and team of horses. He started the first grocery store in a small building on the bank corner. 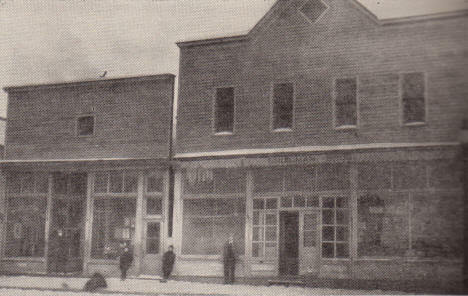 When the new bank was built, the store was moved across the street to the Conte corner. Here Tony continued his grocery business until his new building, the present Gentile tavern was completed on Third Avenue. The Council meetings were held in the store for a few months until the new Village Hall was completed in 1910. Tony was one of the first Justices of Peace in town and likes to tell about the many cases that came to trial. Mr. and Mrs. Chopp had six children, two boys and four girls. At the present time, Tony lives on a farm south of town and is still a picturesque figure coming to town in his old Ford accompanied by his faithful crow. in 1906. His home on Fourth Avenue was one of the very first houses built in Keewatin. They built it using logs that they cleared from their own lot. Besides being an underground miner for a time, Mr. Vercellini was also caretaker for the now almost forgotten Keewatin cemetery. The Vercellini children are Frank, Dominic, Margaret, Lena, and Lola. 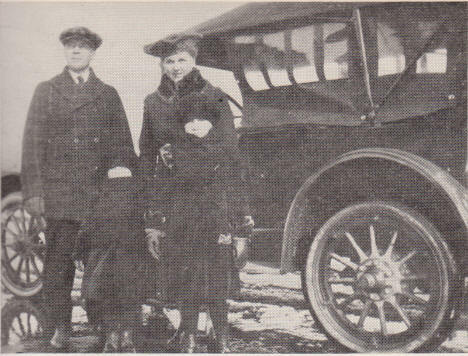 Mr. and Mrs. Phillip Gallina arrived in Keewatin from the Stevenson location in 1913. The members of the Gallina family are Albert, Frank, Argie, Angeline, Alice, Ernest and Edgar. The latter two are deceased. Of the family, Albert is the only one who still resides in Keewatin. Mrs. Gallina, the former Ann Costello, and he are living at the original family home. When Albert's father died, Albert began a grocery business which he continued to operate for 27 years. Moreover, Albert is one of the town's outstanding musicians having played the trombone in the City Band for 35 years. He is also a charter member of the local fire department and the American Legion. Many of the early Keewatin residents came here from Stevenson. Mr. Mike Thomas was one of these. In partnership with Big Jim Theodore, he had a saloon in what was known as the Gontero building on Main Street. When the saloons were closed, they ran a soft drink parlor and restaurant in the Theodore building (now owned by Mike Michelich). In 1930, Mike started a gas station which he still operates. Charles Vadnais, an early arrival here, was identified with the growth of the town. He served on the 'Village Council, was on the police force, was Street Commissioner, maintained a tavern on Main Street until his death. His daughter, Clara (Mrs. Henry Zauhar), still resides here. Jim Reynolds, a brother of Mrs. Wellcome, was also a part of Keewatin's story. He came to town about 1913, was here for a time, and then enlisted in the Canadian Army for the First World War. After the war, he came back and settled on a farm near here. He was also a veteran of the Spanish American War and was always active in any patriotic celebration. Jim died last year at the age of 79. Frank Morris, a real old-timer came to the Forest Mine in 1904. ln 1908, he moved his family to their home on Fourth Avenue. He then became the master mechanic at the Bray Mine. The members of the Morris family are John, Bill, Martha, Rose, and Frank. Mr. and Mrs. Tom D'Andrea moved here from Chisholm in 1910. Until the present D'Andrea building was completed in 1910 by Joe Flower, they lived in the "Ole Wierimaa" building. Mr. D'Andrea had an active political as well as business life. From 1912 - 1914, he served on the village council. He was also on the Water and Light Board, and he was a street commissioner for a time. With Mr. Blackburn and Mr. Verity, he formed a general contracting firm known as the B. V. D. Contracting Co. The first theatre he had was in the corner building of the D'Andrea block until 1923, when the present building was erected. Mrs. D'Andrea and their children Stanley, Rose, Beatrice, Victor, Josephine, Marie, Julian, Anita, and Rita are all living. Mr. D'Andrea passed away in 1951 at the age of 69. James Veronda, who was related to the Vercellinis, came to Keewatin shortly after they did in 1906 and lived on Second Avenue for a number of years. Mr. Veronda is at present living with a daughter, Lillian, in St. Paul. The other children are Margaret, John, Alice, and Catharine. Mike Cappeletti came to Keewatin in 1911 from Biwabik and worked at the Mississippi underground mine. Later, he worked at the Bennett underground as a foreman until he retired a few years ago. Mr. and Mrs. Cappelletti were married in 1919. They have three children, Geno, Guido, and Caroline. Another early settler was Andrew Johnson, who came to the St. Paul mine as foreman in 1905. His family lived in Nashwauk until 1905. While they waited for a house to be built for them at the location. Like so many others, Mrs. Johnson took in roomers because sleeping quarters were in such demand. Mr. Johnson passed away in 1919, but his wife is still residing in Hibbing. Five children were born to the couple, Adele Schirmer, Myrtle Mars, Ruth Fogeleson, John and Reynold. Mr. and Mrs. Al Wellcome came to the Forest Mine about 1914. They soon moved to Stevenson where they started a laundry. In 1910, they moved to Keewatin and made their home at the lake. 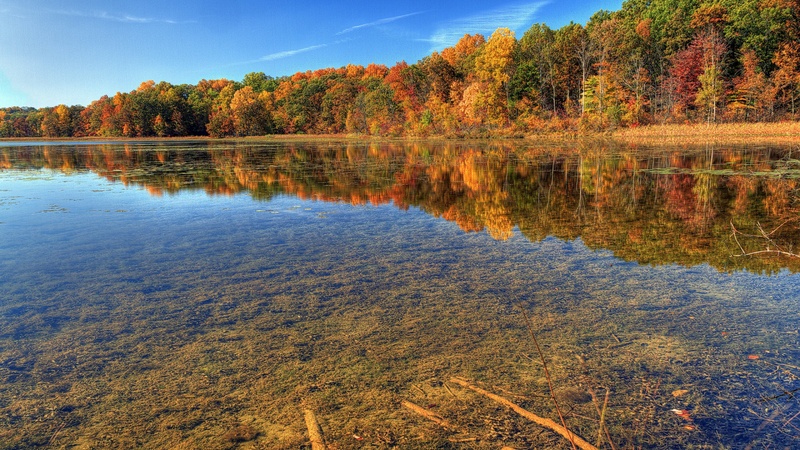 The real name of the lake was Mud Lake, but it has always been called Wellcome Lake. Mr. Wellcome did some logging and hauling with his team and put up ice for the people of Keewatin and surrounding area. He also played the violin and was in demand for dances and parties. He played in several "Fiddling Contests" both here and in other range towns. One son, Ralph, lives in Nashwauk. Mr. and Mrs. A. E. Lewis were early arrivals settling first at the Bray mine, where they had a boarding house. They later moved to town and built the house now owned by Henry Ellefson. They had four children, Glen, Ira, and twin daughters, Alma and Thelma. One of Keewatin's most colorful and loved personalities was Germano Comparoni, who came to Keewatin in 1913 with his wife, Antonetta, and his son, Carlo. He built one of the first homes in Spina Addition. He is remembered singing Italian Opera, as he went along cleaning the village streets. Mr. and Mrs. Kyander are among the early settlers. Mr. Kyander worked in Mr. Latvala's logging camp. Mrs. Kyander, who was a cook at one of the lumber camps, recalls the young village with no sidewalks and streets. They have one son, Armas. Mr. and Mrs. Ole Wigen were among the first to move to the St. Paul. Mr. Wigen worked at the mine, and Mrs. Wigen was very active in the Methodist church which was started at the location and held services in the homes and later in the school. Louis Bercier, W. W. King, Svante Korpela, Anton Maki, Charles Hanninen, Sam Pescatore, Jerry Tobin, Frank Dodge, Jack Stapleton, Frank Fink, Carl O'Rourke, W. W. Nelson, Gust Anderson, Wm. Darling, Pat Carmody, J. Burke, John Kersich, Ed Lynch, George Washington, Charles Graff, Louis Tavelli, Charles Good, Matt Potovich, Ed Bright, Anti Kangas, Arvo Kukkonen, Urho Honkanen, Theodore Gallo, Jacob Fox, Tom Meenahan, John Paatela, Joe Tuomisto, Frank Pribonich, Mr. Bodah, William Lessard, Tom Hannon, Swan Maki, Fred Larson, Peter Bee, Joe Graham, Harry Deforest, Rex Larson, Fred Grenfell. In 1903, when Joe Kolar arrived at the St. Paul location to work, he lived at the boarding house there. He married Mary Prijatel in 1911, and they had four children, Helen and Mary of Keewatin; Joe of Calumet; and Frank of Babbitt. Mr. Kolar passed away in 1940, and Mrs. Kolar is employed in Hibbing. Anthony Falbo was born in Italy in 1887 and came to the United States with a friend at the age of 14. When Mr. Falbo's parents arrived in Hibbing from Italy, Anthony came to visit them. In 1909, he married Nellie Johnson of Hibbing, and they came to Keewatin the same year. He secured a job as janitor of the St. Paul school and was there until the school was torn down in 1931. Then he was transferred to the High School where he worked until his death in 1938. Mr. Falbo was somewhat active in village politics having served one term as village treasurer, one term as trustee, and was a member of the Fire department. However, Mr. Falbo's greatest local interest was in promoting baseball. He did much to foster interest in baseball in the early days It is said that he was quite a baseball umpire in his days. Of their children Louis, Alice, Lillian, Mildred, and Neil live in Keewatin. Della and Sam live elsewhere. W. R. O'Connell, a pioneer businessman, opened his first hardware and furniture store in the Ben Milavetz building in 1910. In 1913 he opened our first funeral home which was simply a little structure on the site of the present Catholic church. As Mr.
O'Connell's hardware business increased, he constructed his new store which is the present Bolf Hardware Co. In 1915, Mr. O'Connell married Miss Ella Halter. Their two children, Mary Margaret and Elizabeth, are now living in Oregon. Mr. O'Connell maintained a great interest in the growth of Keewatin and surrounding territories. Active in village affairs and a prominent old-timer was Charles Extrum who came to the St. Paul location in 1910. Mr. Extrum was village treasurer in 1912 and village clerk in 1914. Of their three children, Irene lives in Rock Island, Earl in Hibbing and Claude is deceased. Emil Zucolli came to Keewatin in 1910 to open a dairy business. But he soon discovered that practically everyone here owned his own cow. Milk at the time sold for 5¢ a quart and was just taken from open containers. In 1935, after working for a number of years at the mines, he became a school janitor, a position he still holds. The Zucolli's have three children, Emma Godak, Rose Reed, and Mario. Mr. Zucolli has many colorful stories to tell of pioneer days, of walking 14 miles to and from work, of working 10 hours a day in water up to his knees, of eating a lunch of frozen bread, and at a daily wage of $1.80. There were many Johnsons in Keewatin in the early days. Melford, Alfred and Oscar Johnson were very early arrivals who lived and worked at the St. Paul. Nels Johnson was the first superintendent at the Bray mine. The first jail was built by John G. Johnson. Ed and another Oscar Johnson were agents for the People's Beer and also started a dray line here. They were brothers. Ed soon left town but Oscar, who now lives in Grand Rapids, was a long time resident. Gust Johnson was active in the growth of Keewatin. He served on the Council and held various other offices. He must have had a good sense of humor because many of the early stories and jokes were told about him. He had two sons, Jim and George. Henning Johnson came here from Snowball. He worked for the U. S. Steel Co. on a diamond drill and lived at the Bray. After a trip to Sweden, he returned to town and has made this his home ever since, being employed at the various mines. Among the other pioneers who came in the year 1906 were the Axel Johnsons who came from Mt. Iron. They recall that the St. Paul houses were just being built and that everything was very primitive. The Long-year Co. brought water around in barrels and was sold for 25c a barrel. The Johnson's youngest daughter, Louise, was born that year. They also have two other children, Walter and Ruth. At present, the couple are in Hibbing. Mr. and Mrs. Swan Johnson are still living here having been here since 1912. He was a shovel operator at the old Bray mine at that time. and then he transferred over to the St. Paul where he lived until they built their home downtown. They have four children, Walter, Evelyn, Wilbur, and Norma. Since Mr. Johnson's retirement in 1954, they have enjoyed a trip to Sweden where they renewed acquaintances with friends and relatives. In 1912, the Peter Knaus' came to the Mississippi location from Chisholm. The family operated a boarding house there until 1917. They then built a home on Main Street here in Keewatin, and Mr. Knaus continued to work in the mines until his death in 1938. Mrs. Knaus kept the home until 1944. Of the Knaus children, Angeline, Mary, Olga, and Stanley are living in Minneapolis; Sophie is a government employee in Jacksonville, Florida; Charles and Lt. Peter have passed away. Mike Drezenovich was one of the oldest residents. His daughter, Mrs. Lee Clemens resides in Keewatin. William Klockers hailed from Norway, Michigan in 1912 to work for the Meriden Mining Co. which later became known as the Bennett Mining Co. He first lived at a boarding house operated by Charles Savoy. In 1913, he married Lillian Halter. They had one son, Harold. Bill is still working as a carpenter foreman for the Bennett mine, a position he has held continuously for 44 years. Some early residents were Louis Alleva, John Heino, John Niemi, Matt Kramerich, John Petelle, George Vranesh, Nick Perella, Mike Pintar„ John Kramerich, Andrew Grabove. Joe Pasquale, Theodore Damjanovic Luke Osborn, John Marovich, Captain Freeman, J. B. Atwood, Joe Parent-eau, Matt Pribanich, D. T. Caine, W. J. Whiteside, Jack Gilling, Tom Newton, and Joe Hurley. The first road from Hibbing to Nashwauk, through Stevenson to the Forest mine and then north of the St. Paul mine. The narrow wooden sidewalks to the Bennet pit. Pete Hill's first Finn bath house at the Y. The watering troughs for horses. Tom D'Andrea's new electric sign, "Tom's Place", the first in town. The red light in Paddy McGuire's saloon which was kept lighted to guide people from the depot to the town. The sign in a restaurant, Meals $.50, Teachers $.75. The menu was always, steak, pork chops, ham, ham and eggs, bacon and eggs, and eggs. The dessert apple, blueberry or pumpkin pie. The goats that ate the fern in the bank. When Empress coffee was 3 pounds for $.97. Meals were $.35. Shows were 10 and 20 cents. Shaves were 20 cents, hair cut 40 cents. A Studebaker cost $1250, and a car license was $5.00. The old wooden snow plows with three teams of horses. The Push and Pull dances at the Village Hall. Wellcome Lake where we had our picnics and went to swim. Little Ralph Wellcome who liked company. The conductor on the "Merry Widow" who treated his passengers to fresh buttermilk. The fire of 1918. Keewatin was saved once more. Cloquet burned. The dance pavillion at the lake where the young people had their parties and dances. Mr. Wellcome and Mr. Milani made good music. The forest fire in 1908. A train was kept waiting to take people out of town if necessary. Chisholm was burned that year. The I.W.W. which stirred up trouble on the range. Bill Haywood was leader. He moved to Russia but was not happy there. Elizabeth Gurley Flynn, worker for the I.W.W., spoke in Keewatin in 1915. She was arrested recently as an active Communist. The first busses to Hibbing with narrow seats along each side. The two bus lines competing for trade. The Hibbing Transportation Co. and the Eagle Bus line. Both lines were fined for racing on the streets. Each bus tried to get here first to pick up passengers. The old road to Hibbing, through Stevenson, Carson Lake, Kerr location past the old Fair Grounds and Pool location and over a short bridge into North Hibbing. Germano Comparoni singing Grand Opera while he cleaned the streets. People welcomed Shuirmans when they peddled clothing and dry goods to the locations. The Stevenson Hill where cars and busses often got stalled. George Williams taking his dog for a ride in his Studebaker. John Gontero's flag during the war years. The raids on hoarders by the rationing agents. Thousands of pounds of flour were found. The Red Cross sewing and knitting during war time. The mechanical piano in the Show House. It usually got stuck on a high note and squeaked. The contests of physical strength between John Gontero and Tony Chicago. The many programs put on by the teachers and the Athletic club to raise money for the Red Cross. The foot race to Stevenson and back to determine which army gave the better training, the Italian or the U.S. Tony Bronca upheld the honor of the U. S. in a glorious finish. John Gontero had to be hauled back. The flour during the First World War. Bread was made with rice or potato flour, or oat meal mixed with regular flour. Food stamps and shoe stamps in second war. The noise when George Williams' new garage collapsed. The famous "Moose Feed" in early Keewatin. The guests enjoyed the food but thought that the meat was rather dark colored. The next day some one found Gust Johnson's horse. It had been shot and one hind quarter was missing. Tony Chopp's mule in the news: "While Tony's mule may be a vicious cuss, his braying is sweet music compared to the noise some of the calamity howlers are making". "Scrapping Joe" also made headlines. He was Ernest Conte's gobbler and could whip anything around his end of the town except a Billy Goat. He used to amuse himself by chasing the neighbor women whom he would find swapping gossip in the back yard. For all his bad traits he hated gossip. He bade his friends farewell last Monday, in time for Turkey Day. Gone but not forgotten, that patriotic friend of man.